Team was responsive and pleasant when I callled with questions. Everyone I talked to was very pleasant and helpful. We would rent one of your properties again in the future. I did send an email when we arrived just to verify that we could use the garage. One document said we couldn't and one document said if the keys were in the unit, we could. They were so I emailed to confirm that we could use the garage and never heard back. Since they were in the unit, we used the garage. It was nice to have the 3 levels. Each bedroom having it's own bathroom was great too. We were told the garage wouldn't be available but it was so that was a wonderful surprise. The only negative were the chairs in the living room. They were hard to get into and hard to get out. More comfortable chairs would be better. We love this rental property as it meets the needs of our extended family of 7 for sleeping, eating, playing games, etc.! This is the 2nd year we have rented this unit. Private spaces for Grandpa & Grandma, grandchildren and their parents! We love that it is close to the Alpine Slide and Grand Marais, plus numerous hiking trails we can take. Quick response to the coffee pot that fell out of the cabinet. Brought a replacement over on Sunday morning. Also did a good job answering questions for my dad during the booking process. Nice central location to explore the North Shore of Minnesota. Lots of room inside and out to relax or get ready for any activity. Extremely helpful, kind, and patient. We were wowed by this townhouse. It is roomy, clean, well-furnished, comfortable, has beautiful views and was, in a word, perfect. Personnel from agents to maintenance were friendly and helpful. Electronic communication was easy. WiFi worked well. Beautiful location on lake. Easy access to hiking trails. Repeat client. We loved being right on the water. It was an amazing view. 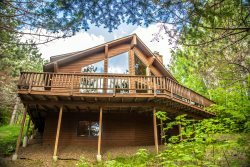 Beautiful home, very roomy and convenient to Lutsen Mountain. We had two families and this home was perect for us. We are considering coming back during the summer, the location is beautiful.